True Detective was a highlight in an already astounding year of television of 2014. The intricate, intelligent writing, atmospheric direction combined with two mesmerising lead performances told a story that stood above the standard procedure of a ‘cops with their own personal demons solve a mystery’. A highlight of the first season was a steadicam tracking shot that followed Rust Cohle in the mayhem of a mission gone wrong. Returning to an undercover role in a biker gang, he accepts to go on a run with them to a stash house to gain more information on Reggie Ledoux in return. What follows is brilliance in camerawork and co-ordination, as we stay focused on the chaotic trouble of Cohle having to pull Ginger out of the stash house, contact Hart, and get into a position where he can collect the two of them, as the breakout of gunfire and sirens surrounds their escape. 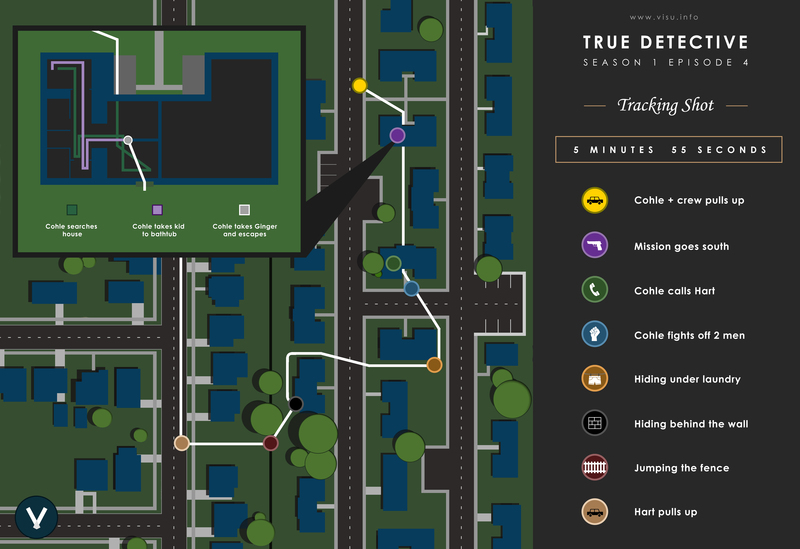 Below is a map of that tracking shot, starting from the initial cut (outside the stash house) to the first cut (inside Marty’s car), as Cohle and Ginger’s tense trip through the streets is laid out.